Good day all! Well it has definitely been a while since my last post. There have been several occasions of dining out and dining over that were truly worthy of posting however my need to lose weight has only had me in the spectator seat. This new lifestyle change begin on January 17th, when I joined a local gym and enlisted the assistance of a personal trainer. Therefore, I spent four weeks eating only the items listed on the body cleanse schedule my trainer provided for me. I will say this was torture! Not the food itself but the torture of not being able to dine out. But I did however enjoy the social interaction of watching new co-workers and friends enjoy foods that I recommended and even those new to me. And after these 4 weeks I am down by 9 pounds!!! 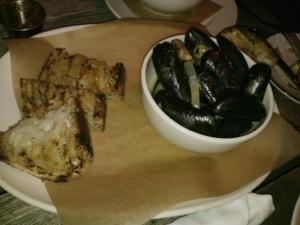 My first social outing during this four-week period was to JCT Kitchen in Atlanta’s West Midtown area. On a cold Atlanta night, my new co-workers and I gathered in the outdoor seating area that was perfectly aligned with torch heaters. Although this night was a test of my will and determination, they apologetically asked “We know you can’t have anything, but what do you recommend?” I honestly believe I was even more excited to share my past experiences of appetizers and entrees at JCT and to watch their eyes light up with each bite. 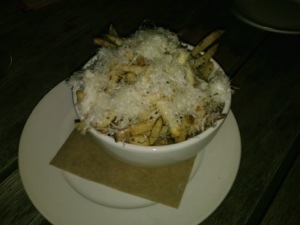 My favorite item to recommend was the Truffle-Parmesan Fries! I will say that even though I can’t provide you with a savory description of the items that were ordered, I will say that the smiles and muffled “mmmmm’s” was enough to say that these items were a hit.